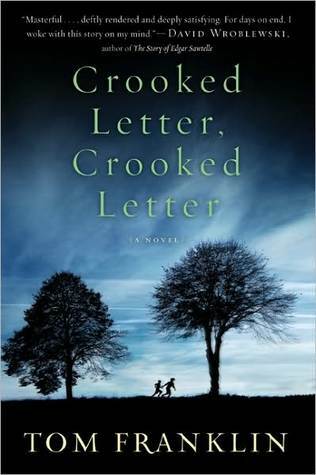 The Augusta Library's Adult Book Club (adult in the strictly respectable sense of being composed of adults, that is) met on Wednesday, Oct. 9, to discuss Crooked Letter, Crooked Letter by Tom Franklin. The meeting featured a long and lively discussion, particularly about the characters' actions and motivations. The general consensus was that the characters were well-developed and the plot intriguing enough to sustain readers' interest. (Although one book club member DID complain that the ending left "too many loose ends...") Overall, though, the members seemed pleased with the selection, and many expressed interest in reading other books by Tom Franklin. The Adult Book Club meets at the library at 6:30 p.m. on the second Wednesday of every month. Our next selection will be Great House by Nicole Krauss; copies are available at the library's front desk. The following is the synopsis of Crooked Letter, Crooked Letter featured on Goodreads.com.